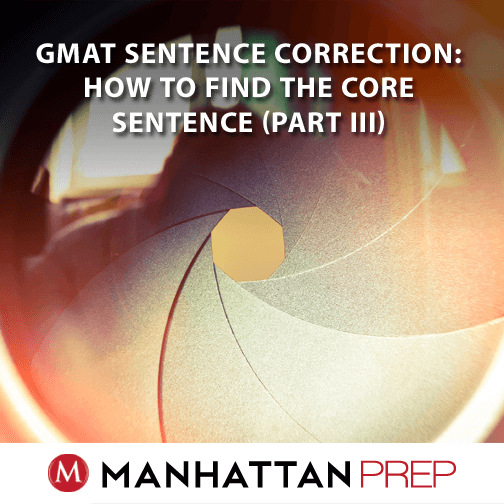 GMAT Sentence Correction: What can the underline tell you? I’ve just finished trying all of the new verbal OG problems. (If you haven’t yet read my earlier installments, start here.) This installment includes my summary of All Things Verbal as well as lists of the new problems by book and question type. Also, we’re hard at work writing new solutions to add to our GMAT Navigator program, so if you have access to Navigator, you can start to check for new solutions there in—best guess—July. Now that I’ve seen everything, I’ve been able to spot some trends across all of the added and dropped questions. For example, across both The Official Guide for GMAT® Review (aka the big book) and The Official Guide for GMAT® Verbal Review (aka verbal-only or the verbal supplement), 6 science passages were added (out of 11 new passages total), while only 3 were dropped. In addition, 3 social science passages were added (compared to 5 dropped) and 2 business passages were added (compared to 2 dropped). So, in the books at least, there’s a slight shift towards science. It’s unclear whether this signals an actual change in emphasis on the test, though; these may just be the best retired passages that they wanted to use. For Critical Reasoning, the same total number of questions were added and dropped. The differential (added minus dropped) for Strengthen questions was +8. Further, 6 of the 22 total new Strengthen questions are fill in the blank (FitB) format, and no new FiTB’s were introduced that were not Strengthen questions. As I mentioned in my first report on Sentence Correction (part 2 of this series), it is difficult to compare categories here because one SC can (and usually does) cross multiple topics. The trends I reported before still hold after my review of the Verbal supplement: meaning and sentence structure are increasingly important, and parallelism and comparisons are just as important as they’ve always been. Ready for the problem lists? 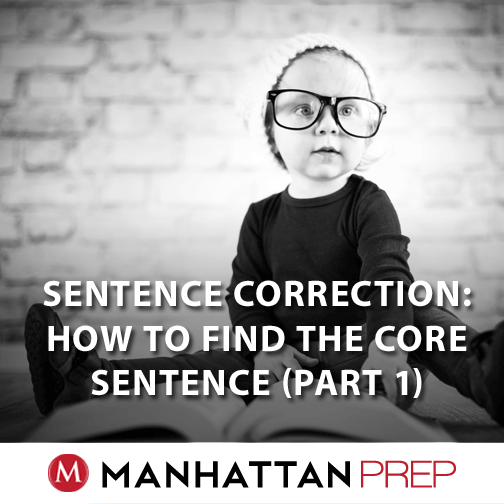 It’s here at last: the fourth and final installment of our series on core sentence structure! I recommend reading all of the installments in order, starting with part 1. Try out this GMATPrep® problem from the free exams. * “The greatest road system built in the Americas prior to the arrival of Christopher Columbus was the Incan highway, which, over 2,500 miles long and extending from northern Ecuador through Peru to southern Chile. The First Glance in this question is similar to the one from the second problem in the series. Here, the first two answers start with a noun and verb, but the next three insert a comma after the subject. Once again, this is a clue to check the core subject-verb sentence structure. The greatest road system was the Incan highway. The noun at the beginning of the underline, Columbus, is not the subject of the sentence but the verb was does turn out to be the main verb in the sentence. The First Glance revealed that some answers removed that verb, so check the remaining cores. “(B) The greatest road system was the Incan highway and extended from Ecuador to Chile. “(C) The greatest road system. “(D) The greatest road system was extended from Ecuador to Chile. Answer (C) is a sentence fragment; it doesn’t contain a main verb. The other choices do contain valid core sentences, though answers (B) and (D) have funny meanings. Let’s tackle (B) first. Yesterday, I worked for 8 hours and had dinner with my family. Those things did not happen simultaneously. One did not lead to the other. They are both things that I did yesterday, but other than that, they don’t have anything to do with each other. In the Columbus sentence, though, it doesn’t make sense for the two pieces of information to be separated in this way. The road system was the greatest system built to that point in time because it was so long. The fact that it extended across all of these countries is part of the point. As a result, we don’t want to present these as separate facts that have nothing to do with each other. Eliminate answer (B). Welcome to the third installment of our Core Sentence series. In part 1, we began learning how to strip an SC sentence (or any sentence!) down to the core sentence structure. In part 2, we took a look at a compound sentence structure. Today, we’re going to look at yet another interesting sentence structure that is commonly used on the GMAT. * “Many financial experts believe that policy makers at the Federal Reserve, now viewing the economy as balanced between moderate growth and low inflation, are almost certain to leave interest rates unchanged for the foreseeable future. The First Glance didn’t tell me a lot on this one. In each case, there appears to be some kind of modifier going on, signaled either by the who / which language or by the comma, but I don’t have a good idea of what’s being tested. Time to read the sentence. Specifically, I don’t like the “now viewing” after the comma…but when I examined it a second time, I couldn’t find an actual error. That’s a good clue to me that I need to leave the answer in; they’re just trying to fool my ear (and almost succeeding!). Many experts believe that policy makers are almost certain to leave interest rates unchanged. This sentence uses what we call a “Subject-Verb-THAT” structure. When you see the word that immediately after a verb, expect another subject and verb (and possibly object) to come after. The full core will be Subject-Verb-THAT-Subject-Verb(-Object). Many experts believe that policy makers __________ almost certain to leave rates unchanged. (A) Many experts believe that policy makers are almost certain to leave rates unchanged. (B) Many experts believe that policy makers and are almost certain to leave rates unchanged. (C) Many experts believe that policy makers. (D) Many experts believe that policy makers will be almost certain to leave rates unchanged. (E) Many experts believe that policy makers is almost certain to leave rates unchanged. Excellent! First, answer (E) is wrong because it uses a singular verb to match with the plural policy makers. Next, notice that answer (B) tosses the conjunction and into the mix. A sentence can have two verbs, in which case you could connect them with an and, but this answer just tosses in a random and between the subject and the verb. Answer (B) is also incorrect. The cat thought that the dog who lived next door was really annoying. The cat thought that the dog [who lived next door] was really annoying. Where’s the main verb that goes with policy makers? It isn’t there at all. Answer (C) is a sentence fragment. Probably the most obvious difference is are vs. will be. I don’t like this one though because I think either tense can logically finish the sentence. I’m going to look for something else. There are two other big differences. First, there’s an idiom. Is it view as or view to be? If you’re not sure, there’s also a comparison issue. Is the economy balanced between growth and inflation? Or between that of growth and inflation? The that of structure should be referring to another noun somewhere else: She likes her brother’s house more than she likes that of her sister. In this case, that of refers to house. What does that of refer to in answer (D)? I’m not really sure. The economy? The Federal Reserve? These don’t make sense. The two things that are balanced are, in fact, the growth and the inflation; that of is unnecessary. Answer (D) is incorrect. The correct idiom is view as, so answers (B), (D), and (E) are all incorrect based on the idiom. (1) When you see the word that immediately following a verb, then you have a Subject-Verb-THAT-Subject-Verb(-Object) structure. Check the core sentence to make sure that all of the necessary pieces are present. Also make sure, as always, that the subjects and verbs match. (2) If you still have two or more answers left after dealing with the core sentence, then check any modifiers. The two main modifier issues are bad placement (which makes them seem to be pointing to the wrong thing) or meaning issues. In this case, the modifier tossed in a couple of extraneous words that messed up the meaning of the between X and Y idiom. * GMATPrep® questions courtesy of the Graduate Management Admissions Council. Usage of this question does not imply endorsement by GMAC. Welcome to the second installment of our Core Sentence series; if you haven’t yet read Part 1, do so now before continuing with this segment. How has your practice been going? It’s hard to develop the ability to “grey out” parts of the sentence in your mind. Did you find that you were able to do so without writing anything down? Or did you find that the technique solidified better when you did write out the core sentence? Most people do have to start, in practice, by writing out the core. The goal is to be able to do everything (or almost everything) in your head by the time the real test rolls around. * “Galileo did not invent the telescope, but on hearing, in 1609, that such an optical instrument had been made, he quickly built his own device from an organ pipe and spectacle lenses. The First Glance shows a possible sentence structure issue: The first two start with a noun and verb, while the third tosses in a comma after that subject. I’m definitely going to need to check for that verb later! The final two start with even though, which signals a clause, but a dependent one. That means I’ll have to make sure there’s an independent clause (complete sentence) somewhere later on. Time to read the original sentence. It’s decently complex. What’s the core sentence? Galileo did not invent the telescope, but he built his own device. This actually consists of two complete sentences connected by a “comma and” conjunction. There’s nothing wrong with the core on this one. Now, you have a choice. You can check the modifiers in the original sentence (and, indeed, if you did spot any problems, you’d want to go deal with those right away). If not, though, then start with those potential structure issues spotted during the first glance. “(B) Galileo had not invented the telescope, but quickly built his own device. “(C) Galileo he quickly built his own device. “(D) Even though Galileo did not invent the telescope, quickly built his own device. Excellent! Now we have something to work with! Answer (C) doubles the subject; we don’t need to say both Galileo and he. Answers (D) and (E) both start with even though, creating a dependent clause. Answer (D) doesn’t have an independent clause later because the part after the comma is missing the subject he. Answer (E) does have an independent clause later, but there’s a meaning problem. The word but already indicates a contrast. Using both even though and but to connect the two parts of the sentence is redundant. Okay, (C), (D) and (E) have all been eliminated. Now, compare (A) and (B) directly. Now, we do have a problem with the structure! If that intervening dependent clause weren’t there at all, then the core could have been okay: Subject verb, but verb. Technically, you wouldn’t want a comma there, but that’s really the only small issue. Galileo did not invent the telescope, but when he heard that one had been made, HE quickly built his own device. Answer (B) is also incorrect. You’re halfway through! Join me next time, when we’ll take a look at another type of complex sentence structure used commonly on the GMAT. (1) In the Galileo problem, only the correct answer contains a “legal” core sentence. Though there are other ways to eliminate answers on this problem, you still need to learn how to deal with structure. GMAC (the organization that makes the GMAT) has said for several years now that they are including more SC problems in which you really do have to understand the underlying meaning or sentence structure in order to get yourself all the way down to the right answer. (2) Complex sentence structures can come in many flavors. One of the most common is the compound sentence, which consists of at least two complete sentences connected by a “comma + conjunction” or a semi-colon. The comma conjunction” structure will use the FANBOYS (For And Nor But Or Yes So). You can learn more about the FANBOYS in chapter 3 (Sentence Structure) of our 6th edition Sentence Correction Strategy Guide. (3) A sentence can also contain dependent clauses (and the complicated sentences we see on the GMAT often do). Common words that signal a dependent clause include although, if, since, that, unless, when, and while. You can learn more about these in chapter 4 (Modifiers) of our 6ED SC guide. 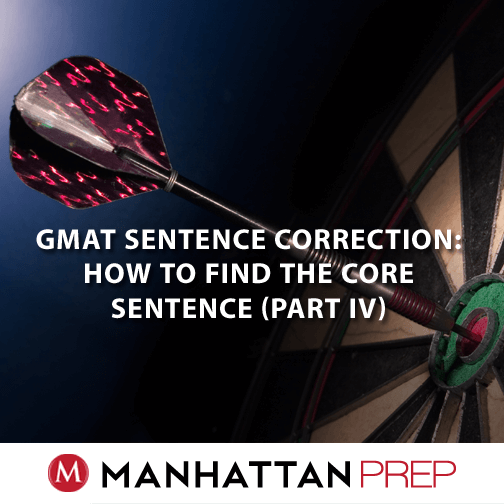 Recently, I was discussing sentence structure with one of my classes and we practiced a crucial but difficult GMAT skill: how to strip an SC sentence to its core components. Multiple OG problems can be solved just by eliminating faulty sentence cores—and the real GMAT is testing this skill today more than we see in the published materials. So I’m going to write a series of articles on just this topic; welcome to part 1 (and props to my Wednesday evening GMAT Fall AA class for inspiring this series!). * “With surface temperatures estimated at minus 230 degrees Fahrenheit, Jupiter’s moon Europa has long been considered far too cold to support life, and with 60 square miles of water thought to be frozen from top to bottom. But I’ve learned better! What is that comma replacing? Check it out: the first three answers all have a verb following Europa. The final two don’t; that is, the verb disappears. That immediately makes me suspect sentence structure, because a sentence does have to have a verb. If you remove the main verb from one location, you have to put one in someplace else. I’ll be watching out for that when I read the sentence. And now it’s time to do just that. As I read the sentence, I strip it down to what we call the “sentence core” in my mind. It took me a long time to develop this skill. I’ll show you the result, first, and then I’ll tell you how I learned to do it. 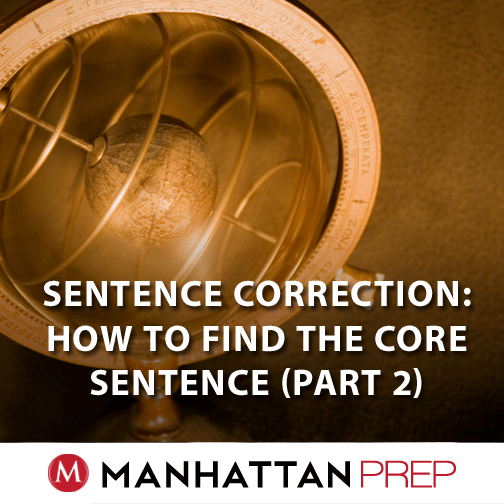 The “sentence core” refers to the stuff that has to be there in order to have a complete sentence. Everything else is “extra”: it may be important later, but right now, I’m ignoring it. I greyed out the portions that are not part of the core. How does the sentence look to you? Notice something weird: I didn’t just strip it down to a completely correct sentence. There’s something wrong with the core. In other words, the goal is not to create a correct sentence; rather, you’re using certain rules to strip to the core even when that core is incorrect. Europa has long been considered too cold to support life, and. “With…” Preposition. Introduces a modifier. Can’t be the core. “Jupiter’s moon Europa” The main noun is Europa; ignore the earlier words. “Europa has long been considered far too cold to support life,” That’s a complete sentence. Yay. “with 60 square miles of water thought to be frozen from top to bottom.” Same deal as the beginning of the sentence! Each word I’ve italicized introduces a new modifier. Nothing here that can function as a subject or main verb. * Why isn’t estimated a verb? ** Why is it that I expected another complete sentence to follow the “comma and”? The word and is a parallelism marker; it signals that two parts of the sentence need to be made parallel. When you have one complete sentence, and you follow that with “comma and,” you need to set up another complete sentence to be parallel to that first complete sentence. She studied all day, and she went to dinner with friends that night. The portion before the and is a complete sentence, as is the portion after the and. “(B) Europa has long been considered too cold to support life. “(C) Europa has long been considered as too cold to support life and has 60 square miles of water. “(D) Europa and its 60 square miles of water. Answers (D) and (E) don’t even have main verbs! Eliminate both. Answers (B) and (C) both contain complete sentences, but there’s something else wrong with one of them. Did you spot it? The correct idiom is consider X Y: I consider her intelligent. There are some rare circumstances in which you can use consider as, but on the GMAT, go with consider X Y. Answers (C), (D), and (E) all use incorrect forms of the idiom. Answer (C) also loses some meaning. The second piece of information, about the water, is meant to emphasize the fact that the moon is very cold. When you separate the two pieces of information with an and, however, they appear to be unrelated (except that they’re both facts about Europa): the moon is too cold to support life and, by the way, it also has a lot of frozen water. Still, that’s something of a judgment call; the idiom is definitive. Go get some practice with this and join me next time, when we’ll try another GMATPrep problem and talk about some additional aspects of this technique. (1) Generally, this is a process of elimination: you’re removing the things that cannot be part of the core sentence. With rare exceptions, prepositional phrases typically aren’t part of the core. I left the prepositional phrase of water in answers (C) and (D) because 60 square miles by itself doesn’t make any sense. In any case, prepositional phrases never contain the subject of the sentence. (3) A complete sentence on the GMAT must have a subject and a working verb, at a minimum. You may have multiple subjects or working verbs. You could also have two complete sentences connected by a comma and conjunction (such as comma and) or a semi-colon. We’ll talk about some additional complete sentence structures next time. Welcome to the third part of our series focusing on the First Glance in Sentence Correction. If you haven’t read the previous installments yet, you can start with how to find a starting point on a Sentence Correction problem when the starting point doesn’t leap out at you. Try out the First Glance on the below problem and see what happens! This is a GMATPrep® problem from the free exams. * “Most of the purported health benefits of tea comes from antioxidants—compounds also found in beta carotene, vitamin E, and vitamin C that inhibit the formation of plaque along the body’s blood vessels. The First Glance definitely helps on this one: comes vs. come is a singular vs. plural verb split, indicating a subject-verb agreement issue. Now, when you read the original sentence, you know to find the subject. So what is the subject of the sentence? It’s not the singular tea, though it’s tempting to think so. The subject is actually the word most, which is a SANAM pronoun. Last time, we talked about how to find a starting point on a Sentence Correction problem when the starting point doesn’t leap out at you. If you haven’t read that article yet, go ahead and do so. The first step of the SC process is a First Glance, something that didn’t help out a whole lot on last week’s problem. Let’s try out the First Glance again and see what happens! This GMATPrep® problem is from the free exams. * “Often incorrectly referred to as a tidal wave, a tsunami, a seismic sea wave that can reach up to 150 miles per hour in speed and 200 feet high, is caused by underwater earthquakes or volcanic eruptions. What did you do for the First Glance? The glance is designed to give you an upfront hint about one issue that the sentence might be testing before you actually start reading the full sentence. Take a look at the beginning of the underline, including the beginning of all five answer choices. The split is between up to and speeds of up to. There isn’t an obvious grammar rule here, so the issue is likely to revolve around meaning: do we need to say speeds of or is it enough to say just up to? Think about this while reading the original sentence. What do you think? The phrase reach up to could go in several different directions—is it going to say up to 150 miles in length? up to 150 feet high?—so it’s preferable to clarify right up front that the wave is reaching speeds of up to 150 miles per hour. That might sound kind of clunky and it is: up to and high are redundant. Okay, answer (A) is incorrect and answer (B) repeats both issues (it neglects to specify speeds of up to 150 and it contains faulty parallelism.). In answer (C), the Y portion is the measurement (200 feet), so the X portion should also be the measurement…but it’s nonsensical to say speeds of up to 200 feet high. Likewise, in (E), the Y portion is a prepositional phrase, so it matches the prepositional phrase in the X portion. Now, the sentence says speeds of as high as 200 feet—equally nonsensical. The only one that makes sense is answer (D): speeds of up to 150 and heights of up to 200. You might also have noticed, in the original sentence, that the last underlined word is the verb is. Sentence Correction problems always have at least one difference at the beginning of the underline and at the end, so glance down the end of the choices. The modifiers have been crossed out. The subject is tsunami, a singular noun, so the verb should be the singular is. Answers (C) and (E) are incorrect for this reason. (1) Before reading the original sentence, make it a habit to glance at the word or couple of words at the start of the underline and each answer choice. Sometimes, the split will be obvious: an is vs. are split, for example, clearly indicates subject-verb agreement. (2) Sometimes the split will be less obvious, as with up to vs. speeds of up to. In this case, if the split is fairly easy to remember, just keep the variations in mind as you read the original sentence, so that you can analyze the difference right away. You may see immediately that speeds of up to is more clear, and your knowledge that the sentence is testing this meaning might also alert you to some of the meaning issues introduced by the faulty parallelism. (3) Making a subject-verb match in the midst of a bunch of modifiers can be tricky. Learn how to strip the modifiers out and take the sentence down to its basic core structure. Want to learn more? Read on to part 3.